MIX ALL: 2 BANANAS AND 5 STRAWBERRIES, 1/2 CUP COCONUT MILK, 4 ICE CUBES. 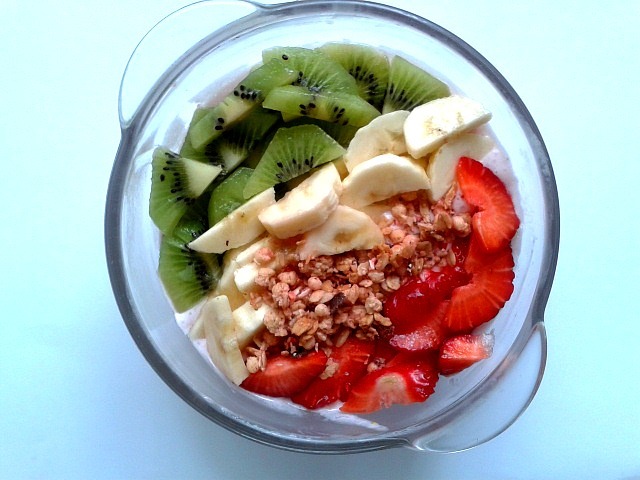 TOPPING: KIWI, BANANA, STRAWBERRIES AND OATMEAL. Bueno, a ver, esta vez lo eplicare un poquito mas rapido debido a que no tengo mucho rato, pero que lo hago si o si para que podais entender. En estos dias de calor, siempre buscamos algo fresco de beber o de comer. Y que mejor que un bowl de smoothie ? Creo que para esta temporada es ideal ya sea de frutas o de verduras o ambos. Es facil de hacer y aqui podemos ser nosotros mismos los que experimentemos y dejemos volar nuestra imaginacion. Tambien hay que reconocer que por su color nos atrae mas. Ya que capta mas nuestra atencion. E fin yo decidi hacer uno de frutas pero aqui os dejo una receta que sirvira en general para hacer unos de estos. Un poco de leche de coco o de almendras, zumo de alguna fruta o yogurt. Y tu ya probaste uno de estos? Si es que si, como fue? Well, to see, this time I will explain a little faster because I do not have much time, but that I do if or so that you can understand. In these hot days, we always look for something fresh to drink or eat. And what better than a bowl of smoothie? I think for this season is ideal whether it be fruit or vegetables or both. It is easy to do and here we can be ourselves that we experience and let fly our imagination. Also it is necessary to recognize that by its color attracts us more. Since it captures our attention more. E fin I decided to make one of fruits but here I leave you a recipe that would generally serve to make some of these. A little coconut milk or almonds, some fruit juice or yogurt. And you already tried one of these? If so, how was it? Karolina 6/15/2016 7:49 p. m.
foryoustyletv 6/15/2016 7:55 p. m.
Świetny deserek.Jeszcze takiego nie przyrządzałam. pat selene 6/15/2016 8:03 p. m.
Sylwia Aga Matuszyk 6/15/2016 8:52 p. m.
Dreamer 6/15/2016 9:41 p. m.
Kocham pandy 6/15/2016 11:51 p. m.
Karolina Przybył 6/16/2016 2:50 a. m.
Michalina Tłomacka 6/16/2016 10:38 a. m.
KosmetykoFanki 6/16/2016 12:16 p. m.
Laura Ja 6/16/2016 3:46 p. m.
Wydaje się być przepyszny :) Piłam kilka rodzai Smoothie,ale niestety już nie pamiętam jakie. Wera 6/17/2016 9:26 p. m.
Kuba Skwarczyński 6/17/2016 9:32 p. m.
Carolina Pawlak 6/17/2016 10:13 p. m.
dreamsstation 6/17/2016 11:36 p. m.
Magdalena Roszak 6/18/2016 12:34 p. m.
Muszę wypróbować. :) Dzięki za inspirację! Anónimo 6/18/2016 12:40 p. m.
przygotowywuję dokładnie takie samo smoothie tylko ja używam musli kokosowego/ cynamonowego ;D przepyszne! Matkovksy plus 6/20/2016 4:05 p. m.
natalie wl 6/21/2016 9:00 a. m.
Anita Nowaczyk 6/21/2016 1:44 p. m.
Skyeenika 6/21/2016 8:44 p. m.
Stegofashion 6/27/2016 5:24 p. m.